I wish I could embed this video, but it's on Facebook, so yeah. (Thanks to True Blue Sam for the lesson in how to embed videos from Facebook. I never knew you could do that.) Still, you should go watch it, if for nothing else to see what an elected official who actually understands the situation and who trusts the citizens who put him in office looks like. For the record, he's warning folks that in the light of the ever increasing terrorist threat, they need to get their carry gun on. Oh, and by the way, if you need help with that, his department teaches a course, free of charge. Hell, I'd consider moving just to be able to vote for the guy. I have to admit that all this Alt-this and Alt-that have had me a tad confused. Just what is the Alt-Right anyway, and what, all of a sudden, is Alt-Light? Do I dare wonder about the Antifa after the farce of Evergreen State? Well, I finally decided to put the Googles to work and I found these two articles, which seem to come from authorities in the field, so to speak. And I managed to do this without linking to the Daily Stormer. Trust me, you don't want to go there. I'm not. Well, not again, anyway. Couldn't manage one for Alt-Light without linking an Antifa site, and I'm not going there, either. Sort of like the Daily Stormer for the other side of the street. It's starting to feel uncomfortably like the late 60s/early70s these days. I'm just waiting on the bombings and airliner hijackings to start. How about a product you can mix on site and apply to your walls to make them bullet proof? If that sounds like something you might be interested in, check out BallistiCrete. Apply it thick enough (2") and it will stop rounds up to 7.62 x 51. This could be some handy stuff. Once again, we remember the men of Operation Overlord. 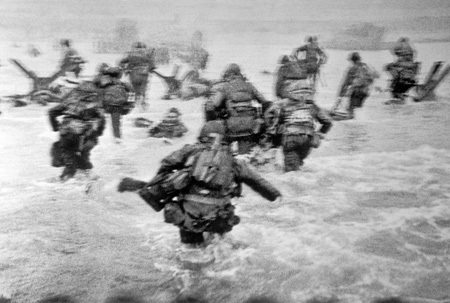 Here you see one of the iconic photos of that day, taken by Robert Capa, of the first wave of troops storming ashore onto the hell of Omaha Beach. And once again, I am in awe of these men, and grateful that they were then when the world needed them. Actually, I have been gratefully busy with paying work, so most things other than the necessities have taken a back seat to that the past 2-3 weeks. This also explains the quiet around here. When you're doing the consulting thing, people expect to see results rather more quickly than they do from employees. It's why we can charge the ridiculous per hour rates we charge. The mast has actually worked out well. The coupling wound up about 4 feet down from the support at the peak of the roof. I'm debating if I need to add a wall bracket at that point to give it some extra strength, but I'm leaning toward "No" on that. 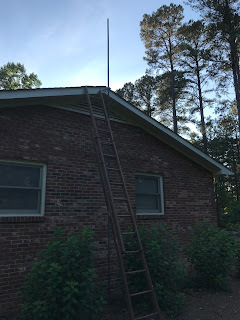 I wound up with almost exactly 6 feet of mast above the peak of the roof, which was my goal. That will allow the rotor and the 2m/6m beam and the omni-directional TV antenna. After those go up, I'm going to see if there is some way to add a discone for scanner use, but I think that may be pushing my luck. 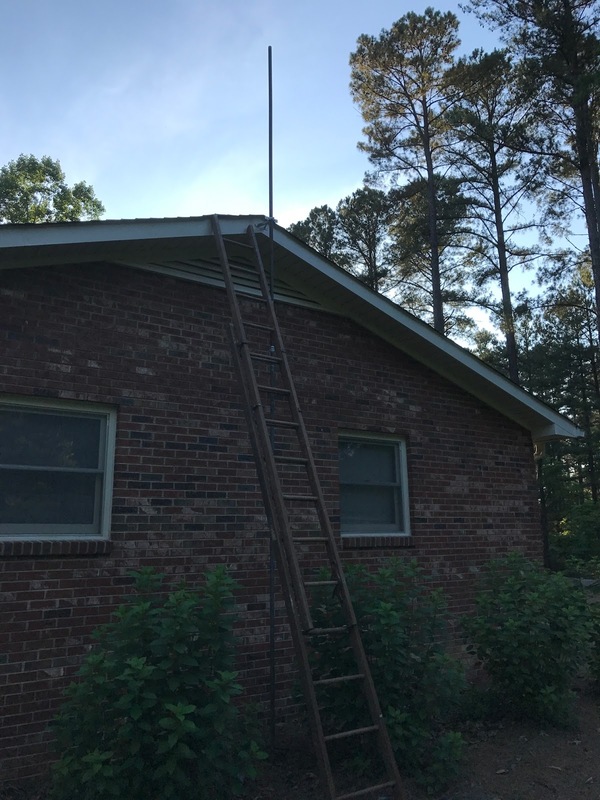 I have two other roof peaks where I can mount something on a bracket similar to this if I decide I really want that antenna up. The next big step is to develop the routing for the antenna cables. I've vacillated over this for weeks. The ground height on this end of the house means that the penetration would be at or below ground level, which is not something I would like. Routing it around the back means lengthening the runs, increasing loss and having all that exposed ugly, which Mrs. Freeholder looks askance at. I could take it in through that vent you see and route a conduit down through a closet, but that just strikes me as asking for trouble at some unforeseeable future time--probably about the time something figures out how to get into the attic. It's a pity that my "wireless" as it's known in the former Great Britain couldn't be, well, wireless. That, however, is the subject for another day. At the moment, I'm just happy to have gotten this far.